As we go through a most absurd election cycle, I’m reminded of the first presidential election I participated in. I was 5 years old, and my kindergarten class was encouraged to vote for our favorite candidate. I remember receiving a black and white paper ballot, complete with the presidential candidates faces, names and parties. Admittedly, I wasn’t following politics as closely as I should have been. I honestly can’t remember who I voted for, but I do know that I was torn between two very strong ideologies. Should the next president be…? 2. Bill Clinton, because George Bush had already had his turn, and if there was anything I’d learned for the past 5 years, it was that nothing was more important than sharing. But there was one person who never entered the running for me, and that was Ross Perot. 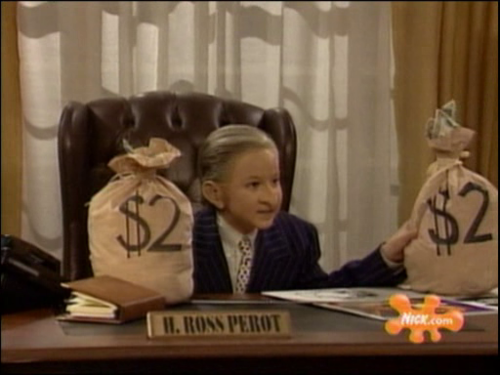 From what I recall, Ross Perot was a tiny person with giant ears only there to throw everyone off from the two tall, handsome (I don’t know) candidates. Truly, my most vivid memories of him are when a young girl-child played him on All That (the girl, as my friend Heather noted, was Katrina, not Amanda Bynes, whom I assume is doing fine, as I haven’t seen her face in the tabloids in at least a year #knockonwood), but that was closer to his second presidential run in ’96. What could be funnier than a 10 year old girl playing an old man presidential candidate? Nothing, it turns out, but an incompetent black valley dude with a braids bob confusing people’s orders at a fast food restaurant. In any case, I wanted to check in on old Rossy to see what he’s up to these days (and what he was up to those days, because I honestly wasn’t paying attention). I know you’re all eager to find out what his whole deal is! 1. 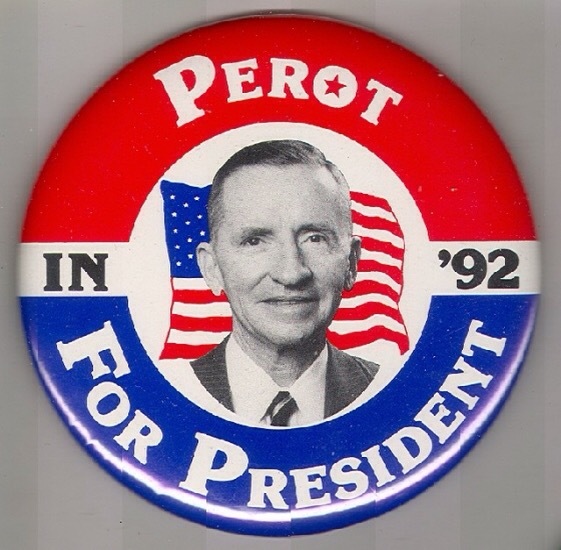 Did you know that Ross Perot is still alive? He’s 85, so I guess that’s reasonable. 2. His net worth is $4.1 billion. GROOOOSSSSSS! 3. In 1984, he bought a very early copy of the Magna Carta, not to be confused with Jay Z’s Magna Carta Holy Grail, which I assume he also owns. 4. He harassed the architect of the Vietnam Vet Memorial, Maya Lin, after learning that she was Asian, calling her an “egg roll.” First of all, did he think white people just have the last name Lin? Also, way to be the worst. (Shout out to Maya – she did that when she was 21…the only thing I was constructing at that age was my Bran Flakes box Halloween costume). 5. Though he was a member of the Reform Party, he did not support Jesse Ventura during his Reform Party run for governor of Minnesota, and apparently made fun of Ventura publicly after JV had a falling out with the press. Just a reminder, Jesse “The Body” Ventura is a massive former WWE (nee WWF) wrestler, so way to pick a fight, Ross! 6. He apparently launched a blog in 2008? Cool. 7. Really, his ears don’t seem that big to me. There are a lot of other facts about old Perot, but a) you didn’t come here for political info, so sorry for doing this to you in the first place, and b) it’s 2016. Stop living in the past. I’m sure some people will write him this November, because that’s a fun option that we all have, but they definitely won’t be Jesse Ventura or Mary Lin. I imagine that 5 year olds throughout the country (and 2-4 year old Montessori students) will be given the same opportunity I had as a child to voice their opinions regarding who should lead the free world. I just hope they take it as seriously as I did, and look back at that day with as much fondness and confusion.